Family life is all about balance. You need a spacious car to accommodate the children but you don’t want something too big and thirsty on fuel, and there’s no point spending a fortune because you’re not going to need it forever. So how do you pick? We’ve rounded up a selection of family cars from our classifieds section, with something to suit all tastes and budgets. So whether you want something small but practical, a bargain price or a bit of luxury there should be something to suitable below. Often spotted running to and from the airport, the Ford Galaxy offers a big boot, seven seats, reasonable fuel economy and car-like handling. With the larger 2.0-litre diesel engine it’s smooth and exceptionally quiet on a long journey, making it ideal for larger families who travel a lot. Our pricing tool indicates that a 2010 2.0 TDCi auto should cost between £13,000 and £14,390, and a quick browse through the classifieds reveals a selection of suitable high-spec models with around 40,000 miles on the clock. Honda’s little Jazz may only be small, but thanks to a very well thought out cabin it’s extremely practical. It’ll easily take a week’s shop, two adults and a child – with room to spare. Adjustable rear seats fold every which way, a double floor in the boot makes for versatile storage and a selection of reliable and efficient engines makes for low running costs. You can expect to pay between £8500 and £9500 for a 59-plate Jazz, depending on mileage and specification. We found a 59-plate Jazz 1.3 i-VTEC in ES trim with 4900 miles for £8995. Built from 2000-2007, the mark III Ford Mondeo was a popular company car and there’s now an abundance of them on the used car market. 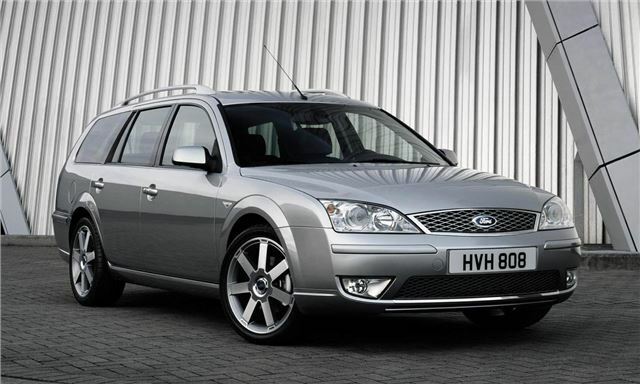 Older models had a few engine issues, but from 2004 on the Mondeo proved to be a well built and reliable work horse, now available for very little money. Estates are less common than saloons, but the estate offers a large boot, ideal for a camping or trips to the rubbish tip with old junk. For a 2004 Mondeo estate you can expect to pay around between £2500 and £3700 depending on specification, mileage and condition. You won’t be able to buy the S40 and V50 for much longer, so until they’re replaced by the new V40 you should be able to secure a bargain – with some good safety equipment offers to boot, including blind spot assist and integrated booster seats. New models start at £19,745 but as the model is on run-out now you should be able to secure a discount. If you buy used aim to pay between £8500 and £10,500. This popular Sunderland built model combines the high-riding driving position of a 4x4 with smaller, family hatchback sized dimensions and low-running costs, so it’s easy to understand its success. There are strong diesels and decent petrol engines, and although the rear seats aren’t as spacious as you’d expect they’re fine for children. It’s been on sale since 2007 and has since undergone its midlife overhaul. Because it’s so popular there’s little variation in used prices, and a 2010 N-Tec 1.6 model will cost £14,000-£15,000. It's 'Like a Golf,' as the advert says. It's based on the Golf platform but is less expensive and more spacious, so as a family car it makes a lot of sense, and most of our readers have good things to say about theirs. There's a broad range of engines from a 1.2 petrol to 2.0 diesel, so there's something for all tastes. According to the used car price guide you should expect to pay £9000 - £11,000 for a 10-plate, depending on trim, engine and mileage. No matter what car you buy, whether a family run about or a two-seat performance car, remember to check our new pricing section to make sure you don’t pay over the odds. Got a better suggestion for a good family car? Tell us on Twitter!